Food packaging probably makes up a large portion of your weekly waste. Going to the grocery store is almost universal, and it's something we do about once a week. It's one of the easiest and biggest ways you can make an impact. Not just how you buy it, but also what you buy. My favorite place to shop is the farmers market. I love buying directly from the farmer. I get a better deal, the farm gets a better deal, and I can get everything package free. If there's a rubber band around the produce, I give it back, and they'll reuse it. Also, if something is packaged, don't be afraid to ask for it package free. I've found that most people are incredibly accommodating. 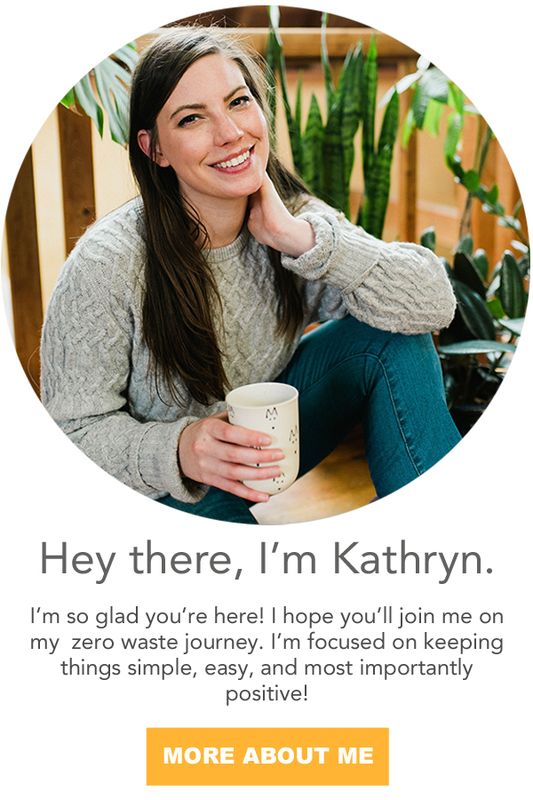 Kathryn: "I don't buy anything in plastic or packaging in general, but I really want to buy this." Farmer: "Of course! Let me bring this in a reusable container with my logo on it next week," or, "Of course, I'll reuse this packaging and I can put it directly in your container." See.... easy! Just talk to people. I know it can be scary; I'm used to hiding behind a computer screen, myself. Having human interaction can be terrifying, but most of the humans I interact with are pretty cool and super accommodating. I buy most of my vegetables loose. I find you don't really need to keep them together in a bag unless it's a whole bunch of small things like mushrooms or spinach leaves, etc. I think it's really important to buy seasonally and locally. Not only is it better for your wallet, but the food tastes better, it's fresher, and it didn't have to travel as far which lowers it's carbon footprint. Now this can be any type of container a mason jar, cloth bag, a stainless steel tin, glass snapware, I've even brought my crockpot. True story. Now, you can weigh these at home on a kitchen scale or go to the counter at your local health food store and they'll weigh them for you. These are the average weights. This weight is called the tare rhymes with pear, mare, and care. And, you'll want to notate it on your container. This is where you have some creative license. check out and dig in! Now, you'll want to proudly head to the register with your filled jars and cloth bags. (I don't weigh my cloth bags because they're so light) The cashier will set your jar on the scale, subtract the tare weight and ask you what is inside. You'll pull up the codes on your phone and she'll charge you for exactly what you bought! Then go celebrate by eating all of your goodies. Why, yes, this is a picture of me sitting indian style and pigging out. If you buy meat, you'll have a similar interaction at the butcher or meat counter. They'll set your jar or container or crock pot on the scale. Then they'll press the tare button to zero out the weight. Then they'll fill it with what ever you desire, charging you only for what is in the jar. It works the same at the cheese counter as well. You can also try to go to a deli for lunch meat and cheese. I don't eat meat, but I still buy meat for my boyfriend. I'm extremely proud of him, he's reduced his consumption down to less than a pound a week. I find this topic to be very sensitive for most people. (hence all of the hate mail I get. ;) In case you're wondering, I don't have any desire to control another human being - nor do I want to.) I think we should all focus on reducing meat and dairy consumption. The average American consumes 270 pounds of meat a year! We can all cut back. But, I can't make any decision on how much you cut back. Only you know what's good for you and your body. I think it's most important for us all to be kind to each other. Everyone is on a different journey and different place in their journey. And, to bring it back up on a positive note! Here are some pictures of my reusable bags and jars. Don't feel you need to buy new jars to fill up. I found most of mine from the thrift store or you can use glass jam jars or marinara or anything you buy in jars. I sewed some produce bags from 100% cotton pillow cases I bought from the thrift store. I used some old dust bags from shoes and purses. And, I bought one set on amazon. If you don't have access to a lot of bulk, you should check out my post on how to shop when you don't have bulk options. 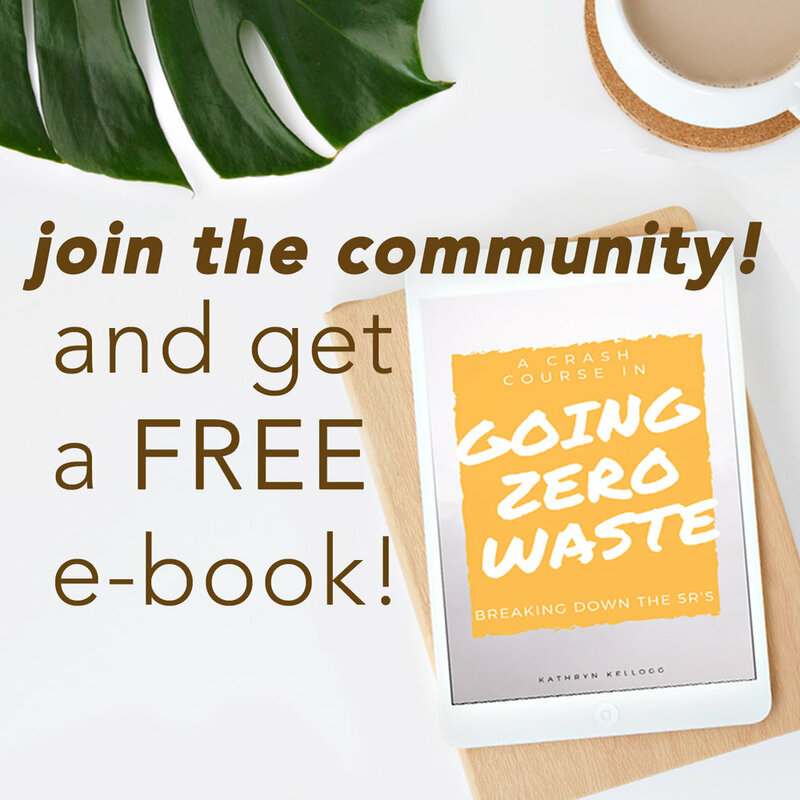 Are you feeling brave enough to go on a zero waste shopping trip?